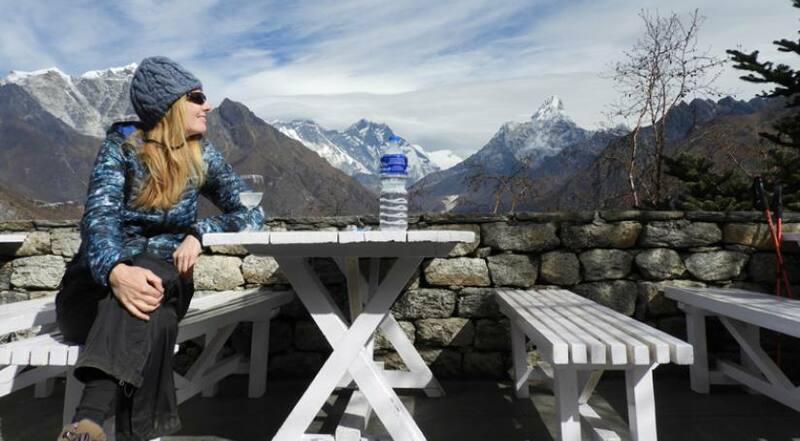 Everest base camp 5,360 M.
Breakfast stop at Shyangboche 3,800 M, near Everest view hotel. Fueling stop at Lukla 2,845 M.
Enjoying time in Everest view hotel while breakfast stop. 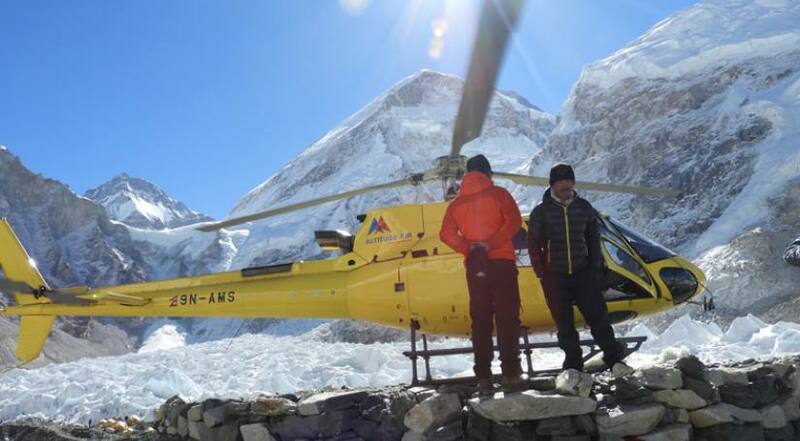 Best time: Jan - May, Sep - Dec.
Everest Base Camp Helicopter tour is an alternative to the two weeks long Everest Base Camp trek on the Everest region. With this EBC Heli tour with landing, you will visit the foot of the Everest in a 4-hours. This tour offers an incredible eagle-eye view of entire Himalayan ranges. The major attraction of this tour is the close-up view of Everest (8,848 m), the highest mountain in the world. However, you will feel so close to the glistering peaks like Cho-Oyu, Lhotse, Mt. Amadablam, Nuptse, Kangtega, etc. This Everest Base Camp Helicopter Flight landing tour emphasizes a great sight of natural beauty, alluring beautiful Sherpa villages, and towns (Namche). The great views of the Khumbu Glacier, located between Mt. Everest and the Lhotse-Nuptse ridge is admirable. The bird's eye view of the high situated monastery like Tengboche is soul soothing. 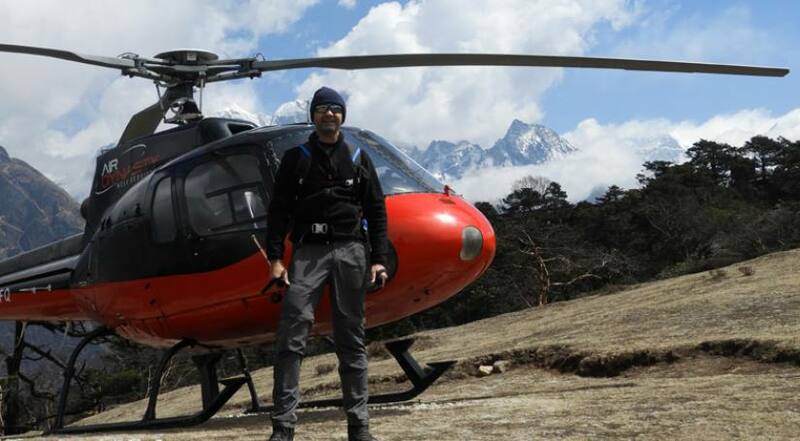 Along with a unique opportunity to reach the EBC, the Everest region tour displays the best aerial views of enjoyable sceneries of magnificent landscapes and serene valleys. The stop at Kala Patthar for the grandest views of the Everest and its neighboring peaks is remarkable. You can click awesome pictures of a panorama of Everest and other peaks. You will have a fine breakfast experience at Everest View Hotel in Syangboche. Because as per our trip plan, we will land at Everest View Hotel for 45 minutes. You can communicate with hospitable Sherpas there. Also, the most admiring Himalayan vistas will accompany you. The weather at EBC varies depending upon the seasons. 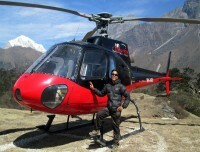 The EBC (5364 m) and Kalapathar (5545 m) helicopter tour are possible in all time of the year. But to best utilize of your tour will be in autumn, winter and spring seasons: (January-May, and September- December). .During these months, the sky usually remains clear. You will have fewer chances of clouds and precipitation is low. So, you the visibility is good during these seasons. The surrounding views are clearer. Weather is the clearest. Days are shorter. The average temperature in the morning and night ranges from -05 to -10 degree Celsius. The daytime temperature with sunlight is a maximum of 15-20 degree Celsius. Temperature and weather conditions vary depending upon the altitude and areas of the visit. These are the coldest months in the Everest region. So, there are more chances of rainfall and snow. Temperature ranges from minimum of -10 to -15 degree Celsius to maximum of 15-18 degree Celsius on average (without wind chill factor). The daytime is mostly clear with blue sky. These are the monsoon months in Everest region. Everest region during these months is wet with heavy moisture. Frequent rainfall occurs mostly in the evenings. The morning time has good weather time in many months. 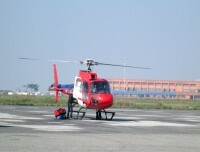 In cases of bad weather, the helicopter does not fly in the region. If so, you will get money refunds. Or, if you have time we can postpone for the trip for clear days. Share our team of Himalayan Joy Adventure about your preferences and when you want to choose this tour. We will be happy to plan your itinerary accordingly. Camera and gears: Batteries, Memory card, Tripod, etc. Travel in private group, this way you can distribute the entire cost among the team. Pre-plan the tour before going for it. Budget planning is essential. It costs around USD 1500 per person. During off-seasons, plan the trip with more spare days. If bad weather hits on a particular day, you may continue the tour the next day. Our team of Himalayan Joy Adventures provides oxygen cylinder to you to make your breathing easier. And to minimize the risk of altitude sickness during this trip. Wear seat-belt during flight. Do not leave the assigned seats during board. Do not throw any objects from the helicopter at the time of the flight. Do not smoke unless the Captain indicates that it is safer to smoke. Keep holding to your allocated seat during the flight and enjoy the alluring Himalayan vistas. The closer and comfortable view of Everest and adjoining giant peaks like Nuptse, Pumori, Lhotse, Mt. Ama Dablam, Mt. Cho-Oyu, Mt. Makalu, Cholaste, Tawache, etc. 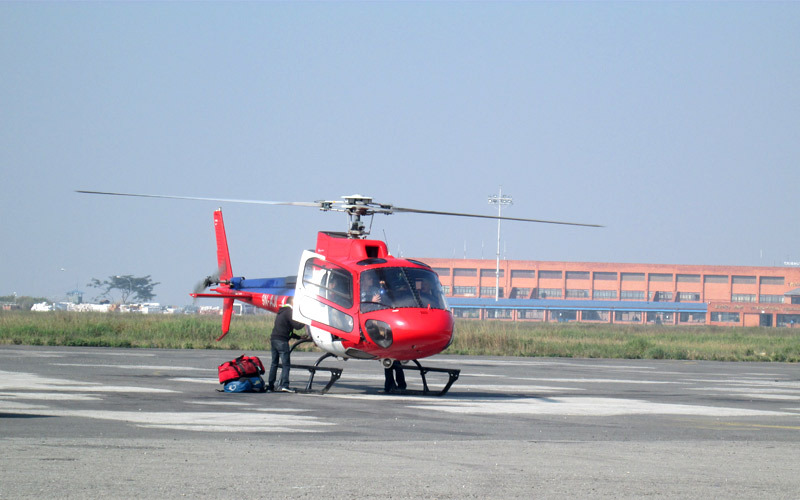 Helicopter land at Kalapathar (5545 m), an optimum Everest View Point (5364 m) and at the Everest Base Camp itself. The entire Everest region, the Sherpa tribe, and the impressive Buddhist culture and traditions. Remarkable Buddhist monasteries, like Tengboche Monastery. Aerial view of majestic green alpine forests, an arctic zone of ice and glaciers. Flight over the incredible Khumbu Icefalls and glacier. Incredible View of Namche Bazar, a busy Sherpa hub in Khumbu region. A delicious breakfast at the Everest View Hotel with a great sight of snow covered peaks and warm hospitality of Sherpas. 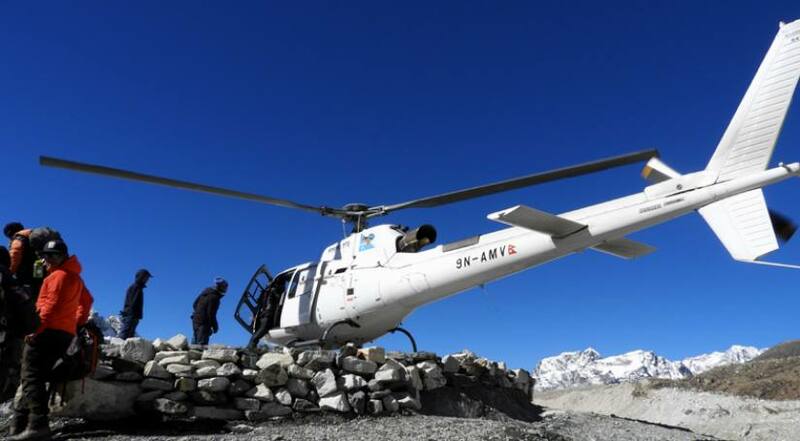 This Everest Base Camp Helicopter tour is a total of four hours tour which includes your flight duration, fueling time, and the time for breakfast you will spend at the Everest View Hotel. On this tour, you begin the flight from Kathmandu to Lukla and proceed to Everest Base Camp or Kala Patthar. 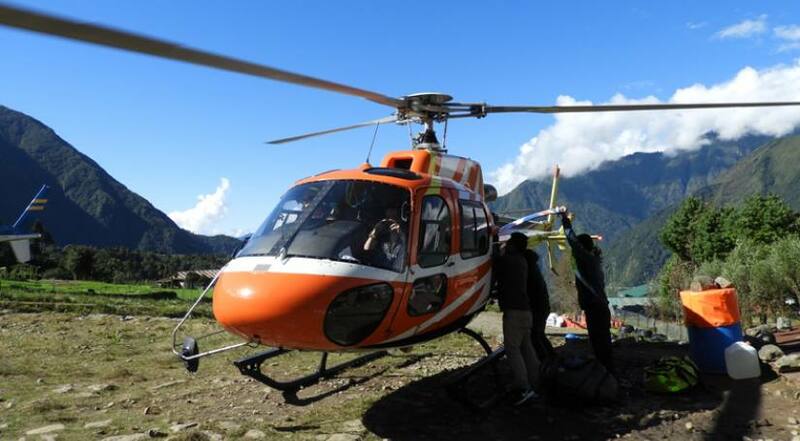 EBC Helicopter tour with landing starts from Kathmandu, flies across different villages and the valleys to finally land at Lukla airport. On this flight, you get to enjoy the eagle’s eye views of the Kathmandu valley along with the spectacular views of the Himalayan ranges, different settlements, the captivating landscapes En-route. 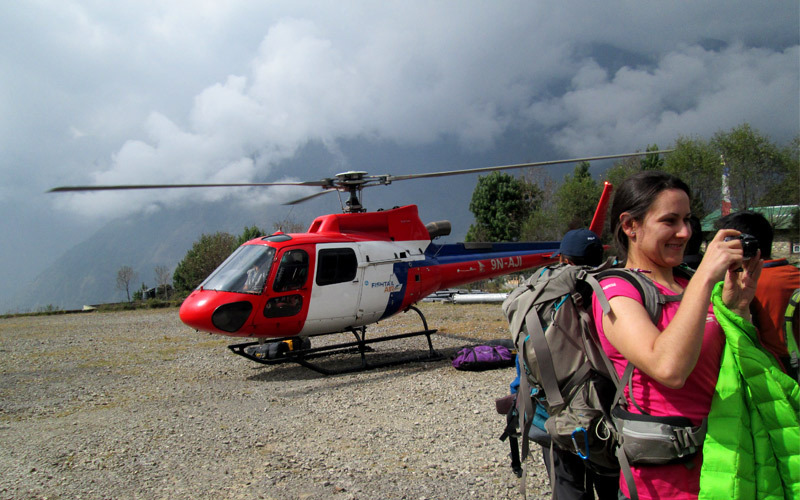 After the 50 minute’s scenic flight we will stop at Lukla for 10 minutes for fueling. Filling up the tank, we again fly to the Everest View Hotel for breakfast. A warm meal on your table and the stunning views of mountains outside your window. What a bliss! As per our itinerary we will rest at the hotel for 45 minutes. After the warm meal and the contending views of the Everest, we board the flight and fly east towards the base of the highest peak in the world. Starting from the Everest view hotel, leaving behind the stunning views of Tengboche monastery, we fly over the Khumbu glaciers. We will land at the Everest Base Camp/ Kala Patthar. You will love the magnificent vistas of Everest along with neighboring peaks from EBC. The place will offer you numerous photo opportunities too. During the 10-15 minutes landing, you can enjoy the mountain peaks and the chilling breezes and click numerous photos for your memories. Before you land, you will wrap yourself in down jackets and feel warm in the chilling surrounding. 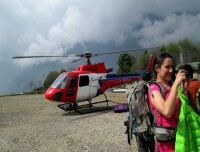 After a beautiful time at Everest Base Camp/ Kalapathar, we board on the helicopter. Bidding farewell to the base of the highest peak in the world and you will behold the enticing views of the stunning mountains for the last time. Enjoying beautiful terrains and landscapes below us, we will leave for Kathmandu. 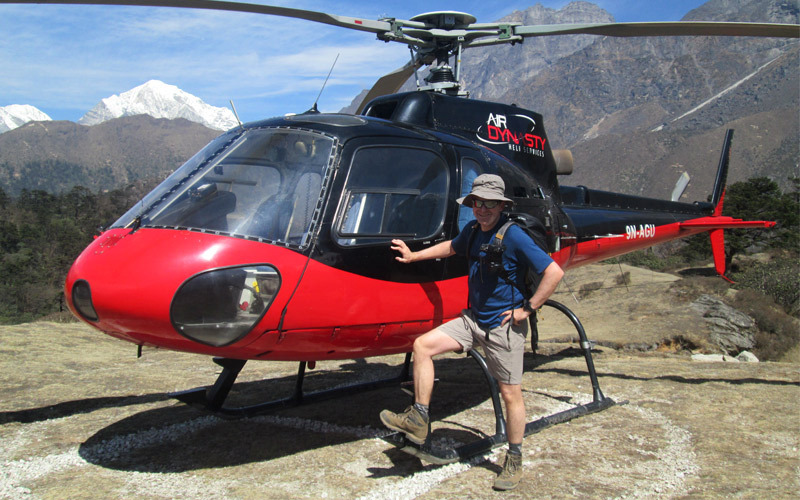 With this stunning flight back to Kathmandu, your 4 hours Everest Base Camp Helicopter tour concludes. We suggest you bring warm equipment because you will land at an altitude of 5545m or 5363m above sea level and the temperature is very low.